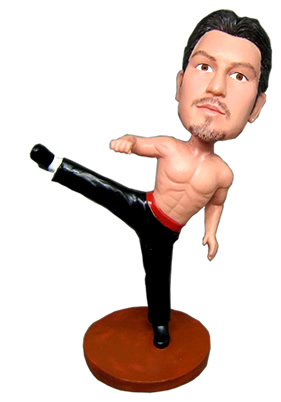 We design and sell custom mabe bobbleheads. We employ some of the most talented painters available to capture the intricate details of your tattoos, logos and sports uniforms. You will be amazed at how much detail they can depict on something so tiny. Our Bestbobbleheads are a lot bigger than you can find elsewhere. Bestbobbleheads dolls are between 8.5 and 9 inches tall, Also 7 or 6 inches. Our larger doll lets us capture more details and create a more realistic face. And besides, our bigger dolls just look cooler! Because we know your bobbleheads are often special gifts for important events, we do everything in our power to get them to you on time. 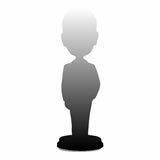 We've heard dozens of horror stories about the important centerpiece of the event, a bobblehead ordered from our competitors, that did not arrive in time. Bestbobbleheads was the first large bobblehead company to make individual dolls, and we've been making them for many years now. Over 96% of our customers would recommend us to a friend, which is quite a testimonial! Our pricing includes all the details like logos, writing on the base of the doll, jewelry and tattoos. Though other companies may offer a lower base price, once you add everything up, you'll still find us to be equal or less expensive than the competitor. Most bobblehead providers use poly resin clay and then they bake and mold the dolls - apply paint and the doll is yours... We uses Polymer Clay - the color is the clay so the final product is actually brighter, true 3D likeness and higher quality.